In the aftermath of a brand-specific pay-per-view, the differences between the WWE’s two brands tend to be clearer than usual. The night after Hell In A Cell, Monday Night RAW is rematch city, even though it has another pay-per-view to sell and needs to move on. The next night, SmackDown! Live lacks the same post-pay-per-view and rematch baggage as RAW, but it also has to build up two pay-per-views in a row. There’s overlap in just one of these shows this time around, as both SmackDown! Live and RAW are preparing for Survivor Series. But while RAW continues to spin its wheels, even with more time and resources, this week’s SmackDown! Live continues the blue brand’s general competence in storytelling as it works toward Survivor Series and its brand-specific TLC pay-per-view. When it comes to that competent storytelling, the biggest story on SmackDown! Live is of course the one that features jobber to the stars (well, star), James Ellsworth. It’s not the biggest story because of Ellsworth, though: It’s the biggest story because SmackDown! Live treats the WWE World Championship as the centerpiece of the entire show. It’s a simple concept and one that feels like it should be the default portrayal of the championship (and its champion). Keep in mind, the most important thing on Monday Night RAW is a list on a clipboard. It’s an entertaining list on a clipboard, but it’s still a list on a clipboard. Ellsworth is an integral part of the main event story, but that’s because of what he brings to the table in his relatively small (but memorable) capacity. It’s not just his weird look or his “two hands” catchphrase that’s getting him over. It’s his ability to sell the story as well as himself. That’s what’s keeping him over. Make no mistake, he’s definitely a supporting character in this story. But he’s a compelling supporting character, especially as a man who’s stuck in between the hubris of AJ Styles and the never say die attitude of Dean Ambrose. Sure, James Ellsworth is opening SmackDown! Live, which may sound like the show and gimmick are jumping the shark… But that would be missing the forest for the trees, as James Ellsworth opening SmackDown! Live is perhaps the clearest example of SmackDown! Live being “the land of opportunity” for WWE Superstars and even aspiring WWE Superstars like Ellsworth. Supposedly “anything can happen” in WWE, but James Ellsworth’s very existence—especially in the context of the actual Styles/Ambrose program—is the type of thing that actually makes that true. And that “anything can happen” attitude that leads to Ellsworth’s existence allows the same mentality to trickle down into the Styles/Ambrose feud. Here, the tension during the main event—with the very real possibility that Ellsworth could accidentally screw Ambrose out of a win for the second week in a row—is palpable, right until the very end when Ambrose gets the three-count. In fact, Ambrose winning feels like the collective weight of that tension has been lifted off of him, Ellsworth, and the audience, so much so that it’s not until Talking Smack when the reality and reminder sink in that Ellsworth disobeyed Daniel Bryan by showing up at ringside in the first place. Years of WWE patterns would suggest that everything comes crumbling down then, but fortunately, it’s confirmed that the Styles/Ambrose title match—a TLC match at TLC in December—is still on. But a man’s livelihood is also now up in the air because he got involved with two Superstars. That’s not a story WWE tells often, but it is a story that’s pretty damn fascinating. And this is all just the seasoning to a Styles/Ambrose feud where their matches only get better with each encounter. That’s not typical, especially not in WWE, where the standard for building a feud is having the same wrestlers fight each other constantly. It wasn’t even too long ago Ambrose (and other mid-carders) was regularly having repetitive matches that quickly became cases of diminishing returns. One might say that “diminishing returns” is simply not something you get with AJ Styles, but on a wrestling show that tries its best not to have the same match over and over again—as it has to deal with the difficulty of having a limited roster—there has to be something truly good there to justify having the same match repeatedly. Styles versus Ambrose works on a basic level by not just being the standard WWE concept of wrestlers fighting each other to sell fighting each other; it’s clearly a matter of wrestlers fighting each other to prove that they’re even in the same league. Ambrose knows he can beat Styles, he just needs to have an even-playing field. Styles knows he can beat Ambrose, he just needs the distractions to stop. And Ellsworth knows he’s messing up, he just wants to fix it. The main event also gives SmackDown! Live a passing grade in clearing its weekly objective of having at least one good-to-great match. Because with SmackDown! Live working more as a storytelling-based show that understands the pay-per-views are the end game, then all it needs is one match to make it worthwhile. This is that match. And it starts the path for them going to war against each other at TLC but also for them having to work together to go to war against RAW at Survivor Series. On the other hand, the SmackDown! Live Tag Team division is just slightly above RAW’s own Women’s division in terms of character/wrestler exposure (or lack thereof), which isn’t good at all. This week is The Headbangers’ first WWE appearance since their return in SmackDown! Live Tag Team tournament, and both appearances have been underwhelming at best. Again, SmackDown! Live being the land of opportunity explains teams like the Headbangers and 2/5 of the Spirit Squad getting chances to prove themselves again—and creates the illusion that the roster is bigger than it is—but the idea of a tag team tournament for Survivor Series spots including either of these teams when the Vaudevillains and Breezango can’t even get on TV is a reminder that SmackDown! Live is far from perfect. The Spirit Squad technically shouldn’t even be in the qualifying round this week because they just lost to the tag champions (who will be in the Survivor Series Five-on-Five Tag Team match). Then again, they do make American Alpha look like a million bucks, and Jason Jordan’s existence prevents Kenny from unnecessarily removing his own singlet top this week. Somewhere in the middle of all of this is the Miz/Bryan/Ziggler storyline this week. The MizTV segment is mostly the greatest hits of this current non-feud feud between Daniel Bryan and The Miz, as Bryan comes on the talk show just to tell Miz that he won’t be on the traditional Survivor Series team. Why? Because he’s a coward again, after last week when he placed Maryse in front of him and refused to bring up his championship rematch clause immediately. By itself, it’s the typical WWE argument that falls apart under scrutiny, as it’s actually smart to use your rematch clause on your terms instead of someone else’s. But the Miz/Bryan part of the story isn’t even what makes the segment fall apart. It’s the fact that Bryan immediately has no leg to stand on against Miz in the Ziggler segment that follows—no matter how much David Otunga tries to push the babyface narrative—in which a surprise open challenge ends up being a nothing match against Curt Hawkins. It’s not exactly what you’d expect from the words “Dolph Ziggler” and (especially) “open challenge.” Instead, it’s an anticlimactic dud of a segment that comes right after Bryan goes on again about Miz being a coward in comparison to fighting champion Ziggler. It also doesn’t help that Ziggler immediately goes on to have a celebratory post-match promo instead of request actual competition on the show. The promo is a way for Ziggler to issue what is hopefully an actual open challenge match—against a RAW Superstar—at Survivor Series, and while such a challenge opens up plenty of interesting possibilities for both brands, the segment does no one any favors. Neither Ziggler nor Bryan come out looking any better than Miz here, especially as the “coward” classification—as integral as it was to the beginning of this storyline—hasn’t really worked much in the aftermath of the actual matches between Miz and Ziggler. And basically, John Cena spoiled mid-card open challenges for all of us. So if Miz/Bryan/Ziggler is the middle of the road this week, I’m still not quite sure how to classify the Wyatt Family/Randy Orton/Kane storyline. Honestly, I’m still not quite sure how to approach it without doing a more personal dissection than usual. I will admit I’m still “enjoying” the storyline more than most, but I also admit that’s mostly because of just how different it is. It’s certainly not everyone’s cup of tea, and I’m not even sure if it’s actually my particular cup of tea. Bray Wyatt, Randy Orton, and Kane really aren’t the hugest sells for most storylines at this point in their careers—which is especially sad for Wyatt, as he’s nowhere near the veteran the other two are—but it gives them all something to do, as weird as it is. 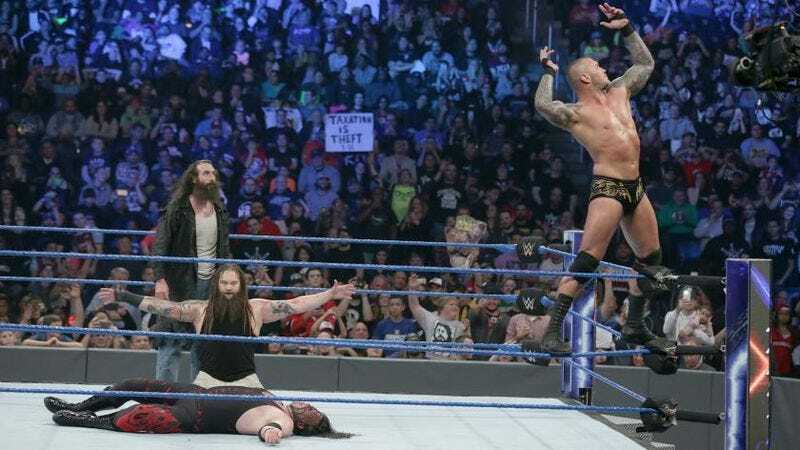 However, I’ve said it before: The fact that a character like Randy Orton, who’s basically a psychopath no matter his alignment, hasn’t really been a part of a more supernatural storyline before this is the truly bizarre part of all of this. With Bray Wyatt and Randy Orton having spots on the traditional Survivor Series team for SmackDown! Live, this story is clearly going to bigger places soon. But what does that mean? Like I said, I’m still not quite sure. But I‘d still say SmackDown! Live has earned the benefit of the doubt, even here. In hair news, Nikki Bella appears to have darkened hers. That’s important because she now looks like she’s cos-playing as an evolution of AJ Lee. So there’s that. Bryan admits in the more neutral setting of Talking Smack that Miz really was a legitimate contender for the traditional Survivor Series match and his in-ring work has been on point, which continues not to help the “coward” excuse. At least not as well as the more reasonable “combustible elements” aspect, because Miz rubbing other Superstars the wrong way is a much better reason for him not to be on the team than Bryan’s (also admitted) hatred for the guy. “Anderson and Enzo had that sweet pumpkin match.” Ah, I can’t stay mad at you, Bryan. Talking Smack has also taught us that Dean Ambrose definitely knows what the SmackDown! Live theme song sounds like, though he doesn’t know the lyrics. That’s fine. Bryan has absolutely no idea what the song sounds like. Dean Ambrose threatened to take out RAW Superstars with the help of the CZW locker room. That happened. Back in the day, one of the biggest problems with the brand split was how RAW would simply poach SmackDown! talent when they saw fit, with little regard for how it would affect the “B-show.” We’re far from that level of deck-stacking yet, but there’s certainly something RAW taking Charly Caruso from SmackDown! Live, leaving behind less-seasoned interviewers like Andrea D’Marco and now Dasha Fuentes, who accidentally calls James Ellsworth “James Ellis.” Then there’s the elephant in the room of Renee Young covering RAW pay-per-views and RAW Talk, which is at least touched on in this week’s Talking Smack (she’s a spy!). Shouldn’t Tom be doing these things? As long as Alicia Fox never shows up, he should be fine. Dasha Fuentes does get points for floating into each backstage interview like a ghost though. This week’s evidence that Shane McMahon doesn’t watch the product? He didn’t know that Natalya’s a cat lady. Please.